Heart murmurs are pretty nifty things to listen to on physical exam. Not only are they discernible somewhat by location, there are lots of special tricks and maneuvers doctors have up their sleeves to figure out exactly what kind of murmur it is. If you are suspecting aortic regurgitation (AR), you should hear it just below the pulmonic area (where the aortic valve is located). 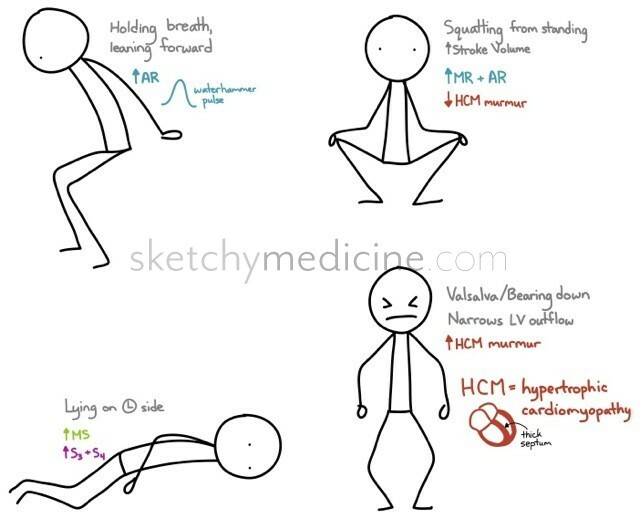 When you get the patient to hold their breath and lean forward the murmur should get louder. 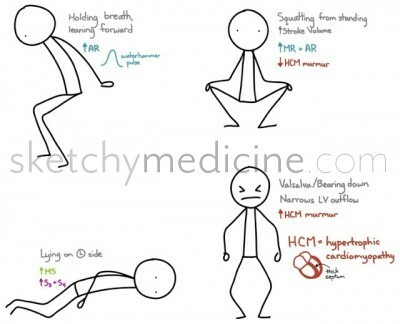 Holding their breath makes mitral stenosis (MS) murmur quieter. Getting a patient to squat from a standing position increases their stroke volume which will make any regurgitation murmur (whether it’s mitral or aortic) louder. Similar to how laying on the left side will make it easier to feel the apical impulse, this maneuver brings out mitral stenosis (MS). love your clever sketches. thanks for being awesome! awesome job! keep up the great work.